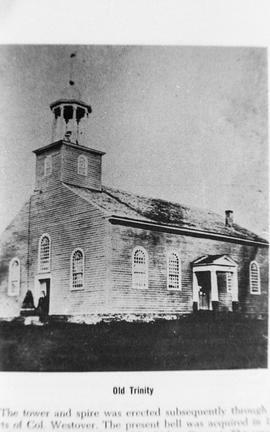 Item is a photograph of the Trinity Anglican Church located in Frelighsburg, built in 1808 and torn down around 1880. 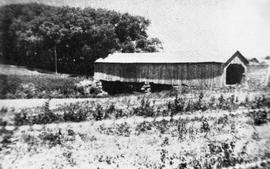 Item is a photograph of a covered bridge and surround landscape located at Krans Corners. Item is a photograph of the protestant school and town hall located in Frelighsburg. Item is a photograph of the town of Hunter's Mills and the surrounding landscape. Item is a photograph from a report of the Bishop Stewart church located in Frelighsburg. Item is a photograph of a large group of people outside the Abbot's Corner Baptist church. Item is a photograph of a street located in Frelighsburg. Item is a photograph of a hill with the town of Frelighsburg in the distance. The item is a postcard showing the Block House at Philipsburg, initially used as a fort and prison, from around 1909. The item is a postcard showing a group of men, women and children in a fenced field with farming implements and piles of hay in Frelighsburg from around 1910. The item is a postcard showing a J.M. Hill's boarding house at Morse's Line, in Vermont, from around the 1910s. The item is a photograph postcard showing the Saint-François d'Assise Catholic Church and presbytery in Frelighsburg from about 1910. The item is a photograph postcard of the Bishop Stewart Memorial of the Holy Trinity Anglican Church in Frelighsburg from around the 1910s. The item is a photograph postcard with a street view of a man and two girls in front of a general store on St. Armand Road in Frelighsburg from around the 1910s. The item is a photograph postcard with a view of the town of Frelighsburg, including the Pike River (Rivière aux Brochets), from around 1914. The item is a photograph postcard of the customs office and border crossing at Philipsburg around 1930s. The file contains primary source information on businesses, landscapes, education, churches and houses in St. Armand Township from 1905 to the 1920s. It consists of postcards of Frelighsburg, Philipsburg, and Morse's Line. The item is a photograph postcard view of the Methodist Church and other buildings in Frelighsburg from around the 1910s. Bishop Stewart Memorial Church, Frelighsburg, Que. The item is a postcard of the Bishop Stewart Memorial Anglican Church in Frelighsburg from around 1920. The item is a photograph postcard of the St. Armand Road, hotel, and general store in Frelighsburg from around the 1910s. The item is a photograph postcard of the Pike River, bridge, and buildings in Frelighsburg from around the 1910s. The item is a postcard of a grist mill and the Pike River (Rivière aux Brochets) in Frelighburg from around 1905. Roman Catholic Church and Rectory, Frelighsburg, Que. The item is a postcard showing the Saint-François-d'Assise Catholic Church and presbytery in Frelighsburg from 1907. The item is a photograph postcard of Main Street with men and children on the street in Frelighsburg from 1914. The item is a photograph postcard with a view of Day Street in Philipsburg from about 1910. The item is a postcard of Main Street in Frelighsburg, showing the Spencer Block and children playing on the street from 1905. Bathing Resort, Pike River, Frelighsburg, Que. The item is a postcard of children bathing in the Pike River near Frelighsburg from 1909.